In the realest sense, sports are trivial. In the grand scheme of things, the result of the biggest college football game of the season doesn’t really have an impact on the world. However, there are certain events in which we need sports to bring us together. We need those traditions, those players, those fight songs to help us rise from the ashes. The tragic shooting deaths of 32 people on the campus of Virginia Tech on April 16, 2007 was one of those events. After so much heartbreak, so much sorrow and so much loss, the university, the town of Blacksburg and the greater Virginia Tech community needed something to lift them up. Fortunately for Virginia Tech, they had a guy like Frank Beamer. Beamer, along with distinguished professor Nikki Giovanni, served as beacons of light for the university, the town and the greater Virginia Tech community. In the immediate aftermath of the shooting, Beamer found himself walking around the university regularly, talking with students, faculty and staff. “I felt like people needed to see someone that they knew, maybe someone that they had seen before, and for that person to be able to convince them that everything was going to be okay, that we’re going to come through this okay,” Beamer said. Beamer recalls one time while walking with long time friend John Ballein, the former Associate Athletic Director for Football Operations and current Senior Associate Athletics Director, when the two encountered a female student on campus. Little did he know at the time, but Beamer’s biggest contribution to bringing the university back together would come roughly four and half months later, when the Hokies’ football team took the field to open their 2007 season vs. East Carolina. It was a grand occasion. ESPN’s College GameDay once again returned to Blacksburg, and brought to light the suffering undergone by the university, but also how much Hokies around the world had looked forward to the game. Theresa Walsh, who was nearly shot on April 16 yet survived the ordeal, had similar thoughts. “It’s going to be a great feeling, because you’re going to know not that we’re over this, by any means no one is over this, but that we’re moving on, that we’re getting through this all together as one big family,” Walsh said on the show. From starting quarterback Sean Glennon’s perspective, the game was all about one thing — returning to a sense of normalcy. “Normalcy — that’s the million dollar word right there,” Glennon said. “Everything was so unordinary, or not normal, for four or five months, that just getting back to regular Virginia Tech student and athlete life was nice, and something everyone was looking forward to. 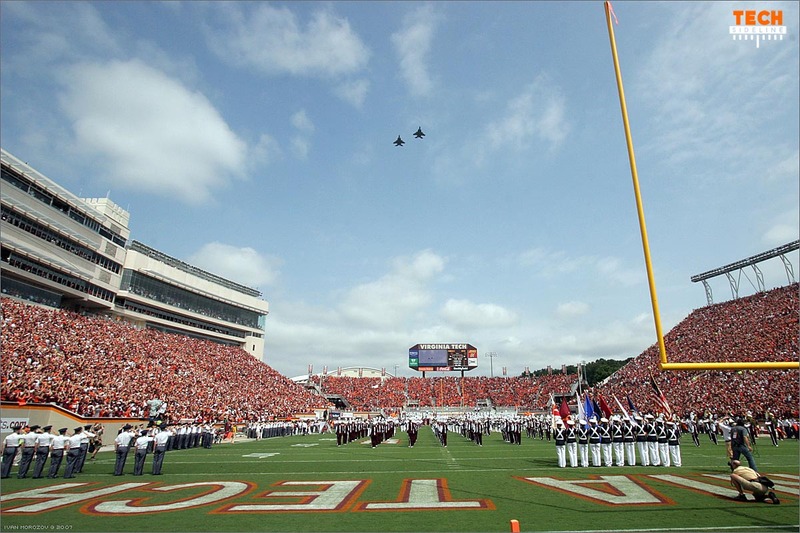 Lane Stadium is well-known for its stadium vibe and atmosphere. 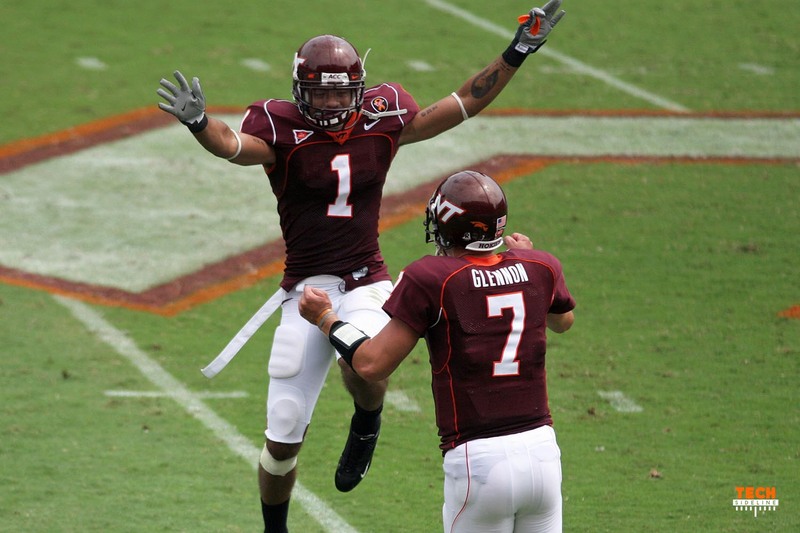 Virginia Tech fans have often been regarded among the best and loudest in the country, but on that day, September 1, 2007, the atmosphere wasn’t the same. Heading into the game, it would be understandable that Virginia Tech carried an extra burden. The No. 9 Hokies knew that they’d be expected to win. Unfortunately for Virginia Tech, they didn’t get off to the best of starts. After forcing a three and out on the Pirates’ first offensive series, Glennon was picked off. “We had a trick play run,” Glennon said. “I was faking the handoff and then I was faking a reverse, and then I was supposed to throw it deep to Eddie Royal. They covered it, they didn’t fall for it, so it kind of went to hell. Before I was about to get sacked, after I saw Eddie wasn’t open, I tried to hit Justin Harper who was cutting across the middle. I didn’t see the linebacker that was out in front of him and he picked it off. The Hokies continued to struggle offensively and with 14:23 left in the second quarter, East Carolina owned a 7-3 lead. “I think sometimes you can want to do something too much, and you kind of get in your own way. Maybe there was a little bit of that,” Beamer said. An anxious Tech crowd watched as East Carolina overmatched the Hokies’ offensive line. Tech could not run the ball, and it looked like the Pirates had a real chance to pull off the upset. However, thanks a great punt from Brent Bowden in the second quarter, the Hokies finally had East Carolina pinned on their own 2-yard-line, right up against the North end zone. East Carolina quarterback Brett Clay, who started in place of the suspended Rob Kass, ran a play-action from his own end zone, and was picked off by Tech’s Macho Harris. Harris ran towards the pylon, leaping in the air to give Virginia Tech a 10-7 lead. With the game still in reach in the fourth quarter, Glennon threw his first touchdown pass of the day to Sam Wheeler, effectively sealing the win for Tech. Virginia Tech went on to prevail over East Carolina 17-7, but they prevailed on more than just the football field. The Hokies, the university and the greater Virginia Tech community had all taken a step towards healing. A step towards normalcy. Fast forward to the present. Virginia Tech seems to have come a long way from that tragic day, but has never forgotten those 32 lives. 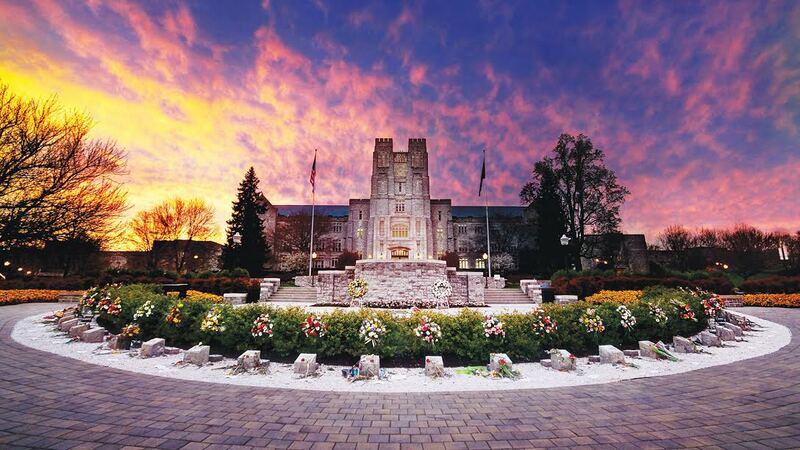 To this day, on midnight of April 16, thousands gather outside of Burruss Hall, right in front of the April 16 Memorial. These Hokies gather not to weep, not to grieve, but to remember and celebrate those lives who are no longer with us. Virginia Tech has learned from that tragedy. The university has taken great steps to ensure another April 16 does not happen again. The greater Tech community has drawn closer, and will draw closer once again on April 16, 2017. The 10-year anniversary of April 16, 2007 will come, and indeed it will pass. For those of you reading, I leave you with these parting words — never forget. Wow, I’m really without words, but very thankful for your words. Thank you! I enjoyed writing this article, even though the subject makes me emotional. Good job Ricky! And yet another fine photograph from RussianHokie! Thank You both. Ricky, this a well-written, heartfelt article that I so much appreciate. Thank you! Thank you. That was something Frank was adamant about, that the university not let the shooting define the university. I believe Tech has accomplished that. This is top notch work. Ricky, you really have talent. And that photo by Ivan – surreal. I don’t know all about the talent, but thank you for that! And yes, Ivan indeed does great work. One of the best I know. Thanks to both Ricky and Professor Roth for their perspectives. We will never forget…and that unimaginable day made Hokie Nation a much stronger family. Go Hokies!! I really do appreciate Bill, Frank and Sean talking with me. I came away enlightened from all three conversations. Thanks; after reading this, I went to youtube to watch Gameday and the 2007 VT vs ECU game. It was emotional and one of the great thing about the internet to be able to relive a moment as if you were there. I unfortunately was OOC (out of country) so could not make it to the game. I was not able to see the game being across the Atlantic back then. Thanks for the story and thanks for getting me over to youtube. We will prevail; Let’s go HOKIES!!! We have prevailed, and will continue to do so. As I rewatched the game for this story, I was really struck by the tribute video that was played before the game. Really moving. Wonderfully expressed, Ricky. Thank you for reminding us of the enormity of that tragic day. And for reminding us of how much we love Virginia Tech. Still makes me tear up. Expresses my thoughts almost exactly. Great photo by Ivan. Thanks for the article. Damn allergies. This is why I pay for this. Thanks a Ricky, that was a Game I had to attend. Drove up from NC, walked the campus scalped a couple tickets and enjoyed the game with some rabid student fans, just what I needed. The game was so special. Thank You. We are Virginia Tech…..
Fine job, made me both proud and sad. Thank you for this. Great perspective. You did a great job with this article Ricky. Thank you for writing it. I tried to take some extra time with this one. Hopefully it showed. Ricky this is the best article I have read of yours. Well thought out, a great capture of the event, and an accurate description of the way Hokies are. In over 50 years of association I believe we are different. I have degrees from 2 other universities, two with big reputations. They can’t hold a candle to Tech and their alumni are just not as much fun to be around. Thank you for that feedback, I really appreciate it. I’ve always said that these are the kinds of stories you love to write, no matter how hard they may be or no matter how sad it might make you. These are the stories that need to be told.